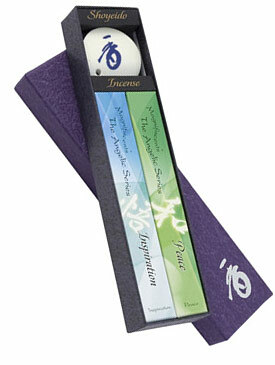 This gift set contains one bundle each of Peace and Inspiration and a custom-made koh porcelain holder, in an elegant Japanese paper-covered box. The Master blenders at Shoyeido have been working with the finest natural ingredients for several years to develop and refine these new scents. Their twelve-generation commitment to quality has helped them reach a new pinnacle in the excellence of incense. No animal ingredients. No animal testing.